Math – a big problem. I love math, but mathematics education is failing miserably. 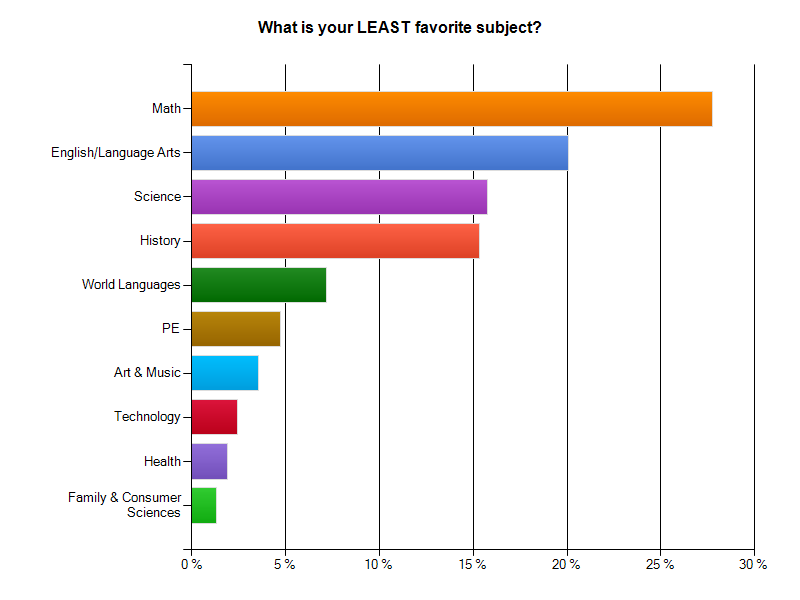 Don’t take my word for it: from the results of our student survey – over 7300 students, 6 -12 – we find that math is the least favorite subject by a good margin – almost 28% of all students. It is my least favorite subject because it is based on rules and there is nothing interesting to learn. Math is boring. It comes easily to me, but I don’t like it. It has no creativity, its all logic. Because there is a specific way to do things and there is no room for creativity. I don’t believe that most of the math we learn will apply to us in our own careers after high school. There is so much repetition in math, it is all about drilling until you get it right. I am very interested in learning what impacts today, and have no interest in learning about formulas. I like Math the least because I think it is boring and there is no creativity in class work. We are just doing exercises all the time and that is it actually. A look at NAEP, TIMSS, and state results where items are released show that the time-honored excuse for dreary plug and chug teaching – standardized testing – does not hold up, as I wrote last year in an article on assessment results. Our students are woefully deficient in solving any problems that require just the smallest amount of transfer of learning (as opposed to plug and chug of simple rules and algorithms.) And nothing in the new standards will change this sorry state of affairs. (I have a Commentary, in press for Education Week on the Math Standards and their great weakness). The goal of the Phillips Exeter Mathematics Department is that all of our students understand and appreciate the mathematics they are studying; that they can read it, write it, explore it, and communicate it with confidence; and that they will be able to use mathematics as they need to in their lives. We believe that problem solving (investigating, conjecturing, predicting, analyzing, and verifying), followed by a well-reasoned presentation of results, is central to the process of learning mathematics, and that this learning happens most effectively in a cooperative, student-centered classroom.Our intention is to have students assume responsibility for the mathematics they explore—to understand theorems that are developed, to be able to use techniques appropriately, to know how to test results for reasonability, to learn to use technology appropriately, and to welcome new challenges whose outcomes are unknown. As in most Academy classes, mathematics is studied seminar-style, with students and instructor seated around a large table. This pedagogy demands that students be active contributors in class each day; they are expected to ask questions, to share their results with their classmates, and to be prime movers of each day’s investigations. The benefit of such participation in the students’ study of mathematics is an enhanced ability to ask effective questions, to answer fellow students’ inquiries, and to critically assess and present their own work. The goal is that the students, not the teacher or a textbook, be the source of mathematical knowledge. Do the authors of the Common Core see that their timid and unimaginative efforts will more than likely discourage the kind of commitment to an authentic mathematics experience that Exeter has shown here? If you would like to hear more on this, go to my podcast on the subject. I have also written an extensive white paper on math curriculum reform. You can download it here: The problem of so-called problems – Wiggins.